NIECON Development aims to sell about a fifth of its A$850 million (RM2.4 billion) luxury twin-tower apartment project in Australia's Gold Coast, dubbed "The Oracle", to Malaysian investors. The 515-apartment project, located on Broadbeach, Gold Coast, is 83 per cent sold with prices averaging A$1.4 million per unit (RM4.11 million). The bulk of the buyers are Australians and the rest from Malaysia, Singapore, China, Russia and the UK. Chief executive officer of Jalin Realty International Pte Ltd, the exclusive marketing agent for Niecon in Malaysia, Ian T.K. Chen, said although the apartments are expensive and the market is soft, the units were sold in six months from its launch. The Oracle is one of the most prestigious projects in Australia and interest is strong as it is close to Jupiter's casino and the Gold Coast Convention Centre. Launched in early 2008, it features 510 units of 1-3 bedroom apartments ranging from 850 sq ft to 3,000 sq ft, worth A$690,000 to A$3 million (RM2.2 million to RM8.8 million). The two duplexes are worth up to A$5 million (RM14.7 million) each, and three penthouses for over A$9 million (RM26.46 million) apiece. Chen said one penthouse was recently sold for A$9.6 million (RM28.22 million), smashing the Gold Coast record for highest penthouse value transacted. "Australians are relatively wealthy and people are buying into The Oracle because it is an iconic building with beach frontage," Chen said in an interview in Kuala Lumpur yesterday. The Oracle is being developed on 8,000 sq m of offices and 4,500 sq m of retail space, making its appeal more attractive to buyers. The whole development, which will be completed by end-2010, is worth A$1 billion (RM2.94 billion). Chen added that Gold Coast is the fastest growing regional city in Australia currently. He said since The Oracle was launched, the value of the apartments have appreciated by 10 per cent and he expects the trend to continue year-on-year, as it has for other properties in the region. "We aim to sell the remaining 77 units of the 1-3-bedroom apartments to high networth individuals in Malaysia within the next three months. We have a long list of potential buyers," Chen said. The units will be launched tomorrow at Mandarin Oriental Hotel in Kuala Lumpur. According to the Australian Bureau of Statistics, Malaysia ranked 10th in terms of top investors in Queensland in 2008. KUALA LUMPUR: Jalin Realty International Pte Ltd, a real estate agent that specialises in Australian prime properties, expects its latest offering in the Gold Coast – The Oracle – to be a major attraction to affluent Malaysian investors. 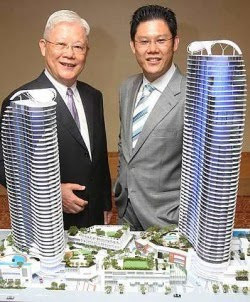 Jalin Realty International principal and chairman William Chen (left) and Ian Chen with a model of The Oracle. Chief executive officer Ian Chen said the company anticipated strong buying interest from locals for the remaining 77 units of The Oracle worth a total A$77mil. The residential portion of The Oracle, which sits on two towers (Tower 1 – 50 levels, Tower 2 – 40 levels), has 515 apartments and cost A$850mil to build. “About 83% of the 515 units have been sold, mainly to Australians, and we expect strong take-up for the unsold units from Malaysia and Singapore,” he told StarBiz yesterday. The prices of residential units range from A$690,000 for single units (850 sq ft) to A$5mil for penthouses. “The largest penthouse located in Tower 1 was sold for A$9.6mil, which was a record for penthouses in Broadbeach,” Chen said, adding that there were two smaller unsold penthouses. The residential units sit on top of one acre of retail area and 8,000 sq m of commercial space from level one to three. The total gross development value of the project is about A$1bil. 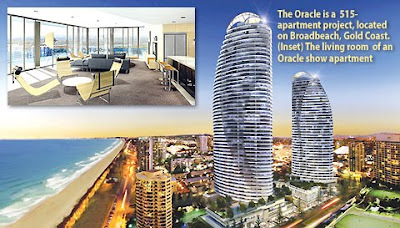 On the selling point of The Oracle, Chen said it fronted the beach and was adjacent to the Oasis Shopping Centre, Jupiter Casino and Gold Coast Convention Centre in Broadbeach. “Another attraction for buyers is that they only have to place a 10% deposit with no other charges until the building is completed, which would be late 2010,” he said. He noted that The Oracle was being built by Niecon Developments Pty Ltd, a highly-reputable Australia developer that had won several awards for constructing iconic buildings. Chen said that on average, high-rise buildings in Broadbeach could deliver 10% capital growth per annum. “The Oracle offers buyers stable and steady capital growth with little or no risk,” he said. Jalin Realty is the exclusive marketing agent for The Oracle. A sneak preview of the property will be held in Mandarin Oriental Hotel, Kuala Lumpur, for selected guests today and during its launch tomorrow. Property developer SP Setia Bhd expects its maiden retail venture to register a 20 per cent return-on-equity per annum over a 15-year period. The Setia City Mall, a retail mall in Setia Alam, Shah Alam, will be developed by Greenhill Resources Sdn Bhd, a 50:50 joint-venture company between SP Setia and Lend Lease Asian Retail Investment Fund 2. The RM450 million mall, which will start construction in two months, is expected to be fully occupied even before it opens in 2012. "We have secured three anchor tenants and are in talks with 50 retailers. We are confident that by the time the mall is completed, it (the 300 units of retail space) will be fully taken up," said SP Setia president and chief executive officer Tan Sri Liew Kee Sin. He was speaking to the media after the signing of a RM315 million syndicated banking facility with CIMB Bank, Public Bank and Affin Bank in Shah Alam yesterday. "This deal, and the commitment from three leading banks, demonstrates that there is no shortage of financial support for good projects," said CIMB's group chief executive Datuk Seri Nazir Razak at the event. The mall will be developed in two phases. The first phase, which has a gross development cost of RM450 million, will begin construction in two months and to be completed sometime early 2012. It will offer about 700,000 sq ft of net lettable area. The second phase, which is expected to have a net lettable are of 1 million sq ft, will be developed in five years. "We will let the first phase stablise first before we start the second phase," Liew said. Also at the signing ceremony, which was witnessed by Selangor Menteri Besar Tan Sri Abdul Khalid Ibrahim, were SP Setia chairman Tan Sri Abdul Rashid Abdul Manaf and Public Bank managing director Tan Sri Tay Ah Lek. "We expect Setia City Mall to dramatically enhance Shah Alam's shopping and leisure offer and draw customers from a wider catchment area with a population of approximately one million people. "The mall also reinforces SP Setia's Live Learn Work and Play vision for Setia Alam and Setia Eco Park. These developments which already have over 20,000 new residents are set to expand to over 50,000 by the time the mall opens," said Abdul Rashid. SHAH ALAM: SP Setia Bhd has secured three major anchor tenants for the first phase of its Setia City Mall in Setia Alam, Shah Alam, says president and chief executive officer Tan Sri Liew Kee Sin. “Unfortunately, we cannot reveal who they are for now. So far, we have also spoken to about 50 potential retailers for the mall and expect a full take-up by the time construction is completed by end-2011. “Construction is expected to begin within the next two months,” Liew said after an agreement signing between Greenhill Resources Sdn Bhd and CIMB Bank Bhd, Public Bank Bhd and Affin Bank Bhd for a RM315mil syndicated loan facility. Greenhill Resources is a 50:50 joint venture between SP Setia and Lend Lease Asian Retail Investment Fund 2 Ltd. The event was witnessed by Selangor Mentri Besar Tan Sri Khalid Ibrahim. Lend Lease, which has operations in Australia, Asia, Europe, the Middle East and the United States, is the mall’s designer while SP Setia is the developer. The first phase will have a net lettable area of about 700,000 sq ft and comprise a department store, 250 local and international specialty stores, major anchor retailers and an entertainment precinct. Its gross development cost is RM450mil. The mall includes access to about 2,000 parking lots and easy connectivity to nearby roads, towns and major highways. “It is targeted at the mid to high-end income group and we hope to attract retailers that cater to that demographic,” Liew said, adding that construction of the second phase would depend on response to the first phase. SP Setia chairman Tan Sri Abdul Rashid Abdul Manaf said the mall was expected to “dramatically enhance” Shah Alam’s shopping experience and appeal to the growing population in the area. “Setia Alam has over 20,000 new residents and is expected to grow to over 50,000 by the time the mall opens,” he said. CIMB group chief executive Datuk Seri Nazir Razak said the shopping centre was the first mall in Malaysia to be financed since the global economic downturn. “This project is timely, given the quiet market currently in light of the economic climate. “This also shows that banks will still lend if the development is a good quality project,” he said. Nazir said local developers should not shy away from projects due to the downturn. “A crisis always presents opportunities,” he said. MORE real estate investment trusts (REITs) could be listed on the Malaysian bourse early next year as yields fall to levels more manageable for the issuers. Malaysian REIT yields are averaging at some 9 per cent but issuers are holding off for yields to drop to pre-crisis levels of 6 to 7 per cent. REIT yields rose as markets were hit last year, causing huge discounts to the net asset value (NAV). "Most investors looking to launch new REIT IPOs (initial public offerings) will want yields to come down. That depends on risk appetite and how the whole global economy pans out in the next 3 to 6 months," said Maybank Investment Bank Bhd equities capital markets director Ramesh Manimekalanandan. He was speaking at a press conference held in conjunction with the Malaysian REITs Investor Education Programme in Petaling Jaya, Selangor, yesterday. Ramesh added that REIT listings could be as early as the first quarter of next year. Among the potential REITs that may list on Bursa Malaysia next year are Sunway City Bhd's (SunCity) REIT and Singapore's CapitaLand Ltd REIT. Currently, Malaysia has 13 REITs listed on Bursa Malaysia with an estimated market capitalisation of RM4.1 billion as at January 2009. Axis REIT Managers Bhd chief executive officer and executive director Stewart LaBrooy said it did not make sense for companies to list REITs in prevailing market conditions as they will not be able to sustain the high yields. "REIT managers are looking for acquisitions but it is hard to find acquisitions that can get you more than 9.5 per cent. It is a tough environment for REITs," said Ramesh. Meanwhile, LaBrooy urged retail investors to consider local REITs as an investment option for regular income and capital growth. "The share price (of REIT) does not matter until the day you decide to exit the REIT. So if your investment horizon is for five to 10 years, the market price is just noise that happens from day to day," said Amanahraya-REIT Managers Sdn Bhd director Sharizad Juma'at. Am ARA REIT Managers Sdn Bhd chief executive officer Lim Yoon Peng added that investors could choose to exit during a market upcycle and re-enter when the REIT's share price falls. Similar to physical property, the regular dividend payment from a REIT serves as rental income while the share price gain serves as capital gain. 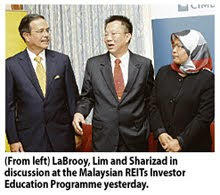 Individuals wanting to learn more about REITs can attend a talk held at Hilton Petaling Jaya on August 15 at 8.30am. It is jointly organised and sponsored by Axis REIT, Amanahraya-Reit, Am ARA REIT, Regroup Associates Sdn Bhd, Maybank Investment and CIMB Investment Bank Bhd.